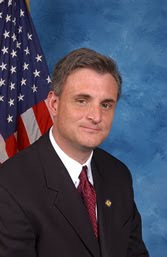 New Jersey Democratic Congressman Rob Andrews will be running for re-election in 2010 against familiar nemesis Dale Glading, you may remember Dale for granting this interview to the American Portrait back in 2008. Glading was only able to garner 26% of the vote in 2008 and while he will definitely fare better in the current climate, his chances of election are slim. Dale writes on his campaign page that with "career politician" Rob Andrews, "not much has changed". Much has been made of Andrews complete debacle in 2008 when he had his wife keep the congressional seat warm for him while he tested the waters for Frank Lautenberg's Senate seat. Andrews tried to claim he changed his mind after deep personal reflection although it was clearly and objectively a bogus story. You may recall me observantly pointing out the fact that Camille Andrews (Rob Andrews' wife and placeholder for his house seat) didn't even bother to put up policy stances on her campaign website. She may be very friendly and nice in person but she was definitely a lousy candidate. While Glading definitely hits some points home against Andrews, mainly the argument that Andrews has an "insatiable" appetite for higher office, he faces a daunting election against a congressional juggernaut. County Republicans would love to brand Andrews as liberal and socialist in the hopes of it gaining traction with a frustrated electorate, but do the facts back that up? The New York Times (an arguably biased source) brands Andrews as a "fiscally conservative...and socially moderate". Glading on the other hand, doesn't give any hints as to his stances on social issues via his website. As Glading has cast himself as a conservative, one would think he would be socially and fiscally conservative. This perceived social conservatism (whether true or untrue, he hasn't said anything to the contrary) goes squarely against the traditional New Jersey mold. In fact, New Jersey's 1st congressional district scores a DVI of +12 (Democratic) in the Cook Partisan Voting Index. So while Glading would more than likely be an agent of change for South Jersey, his social stances might be a tough pill to swallow for many South Jerseyans. So while Rob Andrews' actions were clearly questionable, if no suitable candidate attuned to the county's political leanings emerges, it is this blog's opinion he will be comfortably re-elected in November.